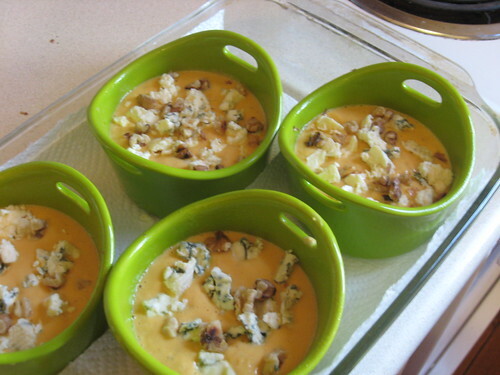 Since I first saw the list of October recipes for French Fridays with Dorie, I have been eagerly anticipating the day when I would make these pumpkin and Gorgonzola flans. I love pumpkin (especially in savory dishes) and over the past few months I have developed a blue cheese obsession, so this seemed like an ideal dish. Unfortunately, these flans seem to have suffered from my own overblown expectations because I just did not love them. 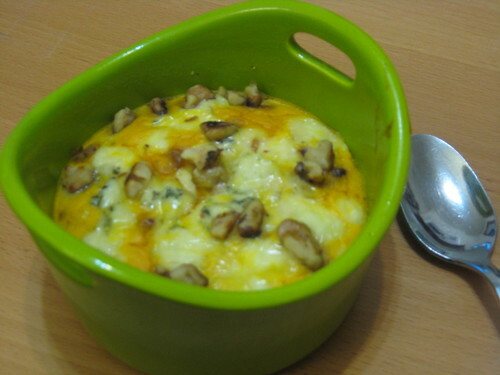 The Gorgonzola and walnuts were delicious, but the pumpkin custard was overly eggy and, for me, it lacked flavor. Raising my expectations too high was not the only thing that I did to sabotage this dish. Because the cheese was quite salty I gave the filling a very conservative pinch of salt, which resulted in the bland custard. Also, I used four 8 ounce ramekins instead of six 6 ounce and reduced the cheese slightly, which left a higher ration of custard to topping. I am being negative about these flans, but I have to say that they were not bad, I just wouldn't make them again without some serious tweaking. 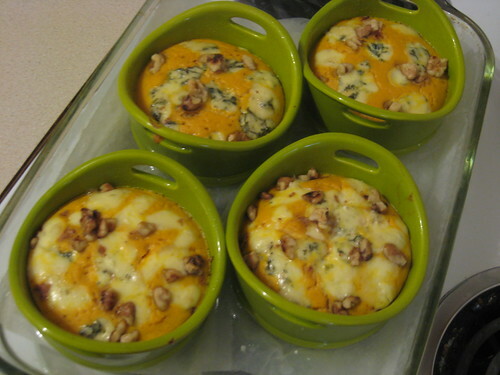 I do like the combination of pumpkin and blue cheese, but I think I would prefer it in a different format. I am thinking along the lines of pasta tossed with chunks of roasted pumpkin and a blue cheese sauce with some walnuts for crunch, or maybe a pumpkin and Gorgonzola galette. Oh yes, I am definitely on to something here. As always, you can check over here to see what everyone made this week and, if you haven't yet, you should pick up Around my French Table (and join in on our cooking fun). Sorry that these didn't meet your expectations, but they look great! Love your ramekins! Beth, I was thinking that fresh pumpkin would help. Especially if I cooked some of the water out to concentrate the flavor. I also needed a lot more salt. I agree. They look so beautiful and have such great ingredients that the expectation is that they will be extraordinary, but they are not. I also did not add enough salt, and I decided that they do need sweetening. I absolutely love your ramekins and your pasta idea is fantastic! I've yet to make these flans and feel I'm really benefitting from everyone's experience. Thanks, onewetfoot. The dishes are from Rachael Ray and I adore them. I so agree with benefiting from other cooks' experience; I only wish I would have read more so that I would have added more salt! Kelly, I did the same thing. Too little salt in the custard as I was afraid the gorgonzola would add too much. I like your pasta w/pumpkin and a bleu cheese sauce idea! Agreed. I had my eye on this recipe since getting the book and it didn't live up to my expectation. Mine also suffered from too little salt. I'll likely try it again with sweet potatoes instead of the pumpkin.